The other day one of my pals, Melanie*, tweeted a question that was being pondered in her workplace: is there any point to wasps? That is, do they seem to serve any useful purpose in nature? The feeling around the office was that they were a stinging nuisance and nothing else, and they wondered why evolution wouldn’t have weeded them out. I’d first like to point out that this isn’t a correct interpretation of evolution. “Evolution” implies natural selection based on genetic changes: that is, somewhere an oak tree has a gene that makes its bark a little thicker than other oaks, which helps protect it against parasitic insects, which means it stands a better chance of surviving than other similar trees, which means its offspring have a better chance of being produced, which means they’ll also have thick bark, and they out-compete other trees and thrive. While it may typically be true that plants and animals all seem to have their place in nature it’s a romantic falsity to presume that everything evolves to some “purpose”. Things either thrive and reproduce or they don’t, and get selected or deselected. So wasps don’t need to have “a point” to existence; they only need to be able to thrive better than anything else which competes against them. But I’ll get off that slightly pedantic high horse now. The point is that wasps actually do have purposes; that is to say, there are things they do that are useful to other organisms than themselves. Lots of animals – as was pointed out in a book called Does Anything Eat Wasps? – do eat the little stinging buggers. 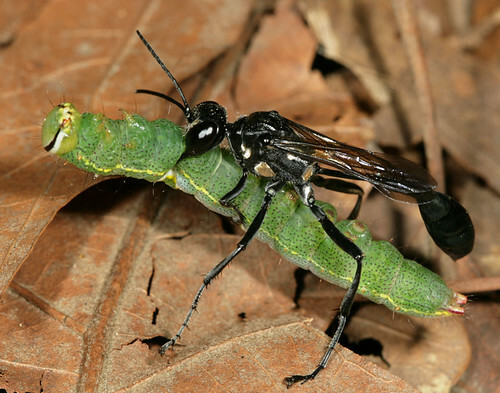 Wasps are garden pollinators, and eat garden pests like aphids. Some species are very good at pollinating figs. And some not only kill lots of pest insects, but – due to their simple DNA structure – mayhelp scientists research pest controls, medicine, and genetics. Wasps do good stuff, believe it. *This is her real name. Her real, full first name. I wanted to point out that I did not call her “Mel”. I’m sure her mother will be pleased.